This post is sponsored by Cuties Citrus. All opinions are mine alone and partnerships like this help keep the blog ad free for your enjoyment. I hope you love the product and the Winter Fruit Salad with Cinnamon Vanilla Dressing as much as I do. Enjoy all the best of in-season flavors with this Winter Fruit Salad with Cinnamon Vanilla Dressing. It’s great for the holidays, a potluck, or Thanksgiving! This easy-to-make recipe is great for chefs of all ages! 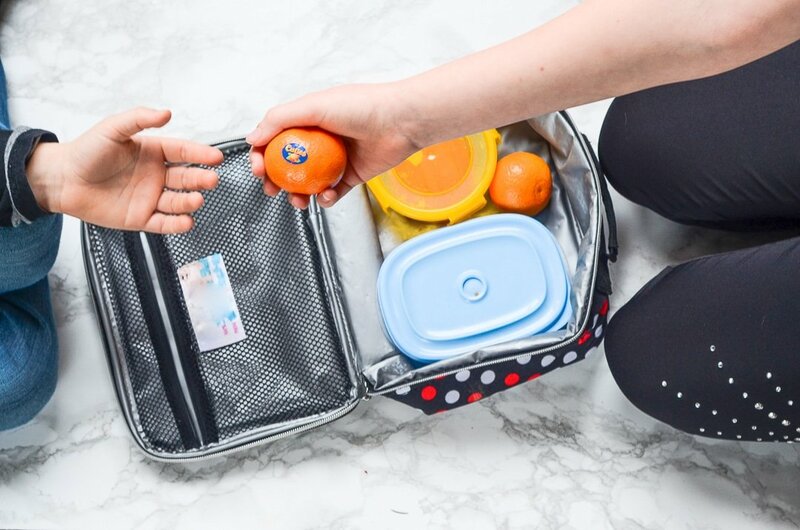 With the winter holidays fast approaching, time spent in the kitchen seems to amplify; and if you have kids, then you quickly discover how helpful (albeit slow) extra hands can be. Today’s Winter Fruit Salad with Cinnamon Vanilla Dressing is a great teamwork recipe and is perfect for little hands of all ages. I look forward to Cuties’ return to the store every year, and I’m ecstatic that they are finally here! You too can celebrate 100 Days of Sunshine and brighten someone’s day by sharing some delicious cuties this season! Show it off using #100DaysOfSunshine! Just because the chefs preparing this Winter Fruit Salad with Cinnamon Vanilla Dressing are pint sized, doesn’t mean that they can’t master some basic culinary proficiencies to make this recipe shine. How to Make Simple Syrup. This recipe calls for a standard (or basic) simple syrup. Learn how to get the right ratios and my tips for infusing it with the cinnamon vanilla flavors. How To Buy & Store Citrus. Involve the kids by teaching them what to look for at the store and how to keep it fresh when you get it home. Apples 101. This recipe uses Fuji apples, but if those aren’t one of your favorites, use the FAQ’s here to help you pick the right apple for you. 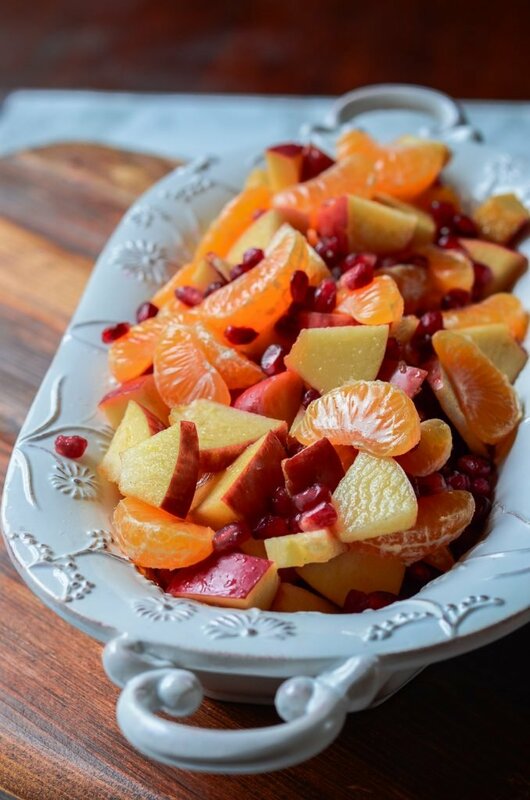 If you have leftovers of this Winter Fruit Salad with Cinnamon Vanilla Dressing, it will hold in your refrigerator in an airtight container for up to five days. During that time, you may find that the apples begin to brown. However, the sugar in the simple syrup will help slow that process. If you have leftovers of the cinnamon vanilla simple syrup, it will stay fresh in the fridge for up to three months when stored in an airtight container. One of my favorite things about this recipe is that it gets better overnight. 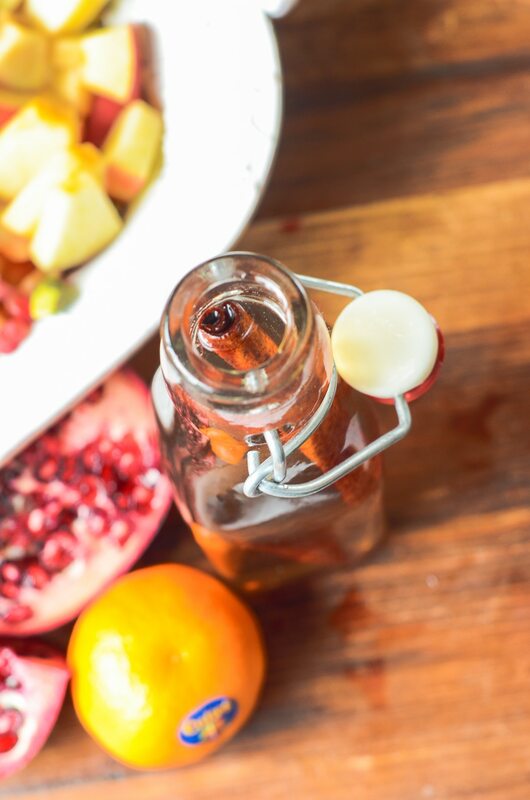 As the dressing settles into the fruit, the natural sugars, cinnamon, and vanilla meld together for a divine flavor combo. This is also a fantastic recipe for kids to work on for Thanksgiving; they can make it ahead, or it can keep hands busy on turkey day. Get your free printable grocery list for this Winter Fruit Salad with Cinnamon Vanilla Dressing HERE. This grocery list has everything that you’ll need to make this Winter Fruit Salad with Cinnamon Vanilla Dressing recipe. To help in making grocery shopping simple, each ingredient is listed in easy-to-find grocery store amounts. If there is no amount specified, that means that you can buy the smallest (or largest) container available and still have plenty left over. 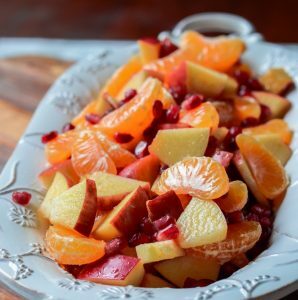 Enjoy the best of in-season winter fruit with this Winter Fruit Salad with Cinnamon Vanilla Dressing. It's great for the holidays, potlucks, Thanksgiving, and entertaining. In a small sauce pot, combine all of the ingredients for the Cinnamon Vanilla dressing. Stirring regularly, bring the mixture to a simmer then turn off the heat and let the dressing cool to room temperature. About 1 hour. In a bowl, combine the Cuties, diced apple, and pomegranate arils. Stir the cooled cinnamon vanilla dressing a little, then pour desired amount on top of the fruit salad. Toss until the fruit salad is evenly coated. Serve. *If you don't have a vanilla bean, one tablespoon of vanilla bean paste or pure vanilla extract will work. I love the idea of this salad! Vanilla and cinnamon mixed with winter fruit… such a good idea and so beautiful! I am definitely going to be making this. Yum! It’s all the best of those warm and comforting winter flavors! It’s divine! It’s soooo good, Daisy! It tastes all the best of Christmas combined! Yum! What a fantastic idea! I love cuties, too. They taste like sunshine! They really do! They always put a smile on my face! This is so gorgeous! I usually don’t think about making a fruit salad in the winter since the produce selection is lacking, but I love the monotone nature of in-season fruits. My toddler loves pomegranates, so I know he’d be all over this! I’m with you on the winter fruit salad thing! I wish there was a bit more to add variety to it, but what it does have is fantastic! The Cinnamon vanilla dressing sounds like a real treat on the fruit salad. I see how this could make a very exciting winter salad. That gets me into the festive mood, even here in the tropical heat. The dressing is absolutely what makes this recipe complete (and it definitely gets me into a festive mood, too!)! It balances out the tang of the citrus and definitely! This looks lovely and so perfect this time of year! I love that you included your kids in the process. I’ve always heard that they’re more likely to eat something if they had a hand in preparing it! That absolutely makes sense! That’s definitely case with both of my daughters! Commenting again, Mack, as I suspect the comment I left on this post over the weekend didn’t log into the system. Anyway, I love this! Vanilla + cinnamon + citrus sounds like a surprisingly intriguing combo, and as I’ve started cooking again last month (yay! ), this recipe is something I’ll save to try. I haven’t been by your blog in a while but glad to see you going strong. Hope you are well! I’m glad you did comment again because the first one didn’t go through. It’s such a good combo, I hope you get to try it now that you’re cooking again, Daisy! Oh this salad looks so exciting with all the lovely fruit colors combined and the dressing looks amazing too! So often winter foods are dull to look at, but this winter fruit salad is so pretty and enticing! Plus, it packs so much flavor with little effort. Oh man, I love a good pun Michele. Thank you! I hope you love the recipe! Yes to all these things, Donna! I love how easy this recipe is for the kids to contribute to. Plus, it has something for every age to try to help with. Now this is my type of fruit salad! How did you nail literally all my favorite fruits into one salad? Beautifully presented too! Thanks for sharing! Thank you so much, Lois. It has so many favorites, it’s a great recipe for pleasing almost anyone. What a pretty salad!! Fresh veggies in spring and summer and winter fruit in the cold weather. Somehow a salad out of fruit sounds so good with the heavier food. Your salad has just the right amount of flavor combination. I totally agree with it feeling light and fresh amidst the heavier winter foods. Plus, you get that vitamin C boost! When I think of fruit salads, I always think about summer as well! I hope you get to try it and love it! 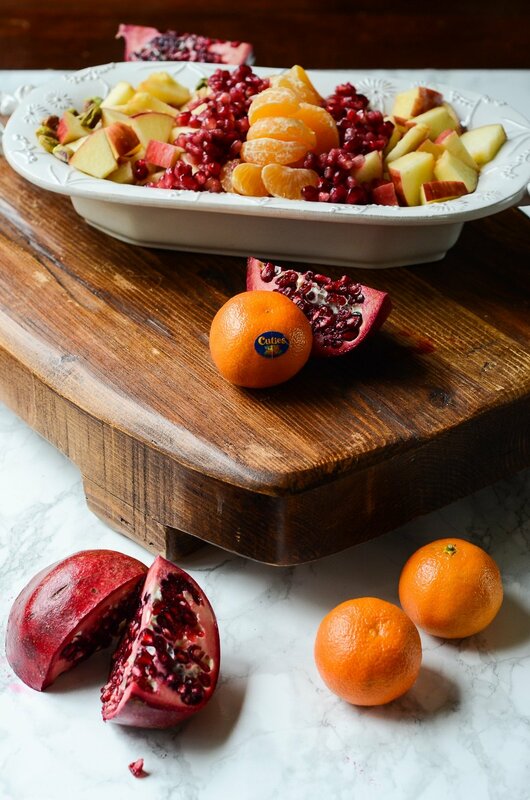 This looks lovely – I just love the idea of combining these little oranges with pomegranate! And, I happen to have some leftover pomegranate seeds in the fridge right now. This might be happening with dinner one night this week! I hope you love it! It makes such a delicious winter treat! Now I know what I’m taking to a pot luck Christmas party! Yes!! It’s always a big hit at a party! This looks like a lovely salad for holiday entertaining! It definitely is! It’s so easy to scale and make larger for big get-togethers! Mackenzie, your Winter Fruit Salad has all the fruits my wife and I like. I plan on making this for our New Years Eve dinner. I noticed an article on Fennel Orange Marinade that I need to read. Your pictures are outstanding do you mind shearing how you produce them? Thank you for the kind compliment, Dave. I hope you love the fruit salad (and the marinade when you get around to it!)! Send me a picture when you make them! This salad looks so fresh and colorful. I like it, as the fruits have been kept mostly true to their original edible form. I have never tried this type of dressing before, with spices and sugar. The flavors seem to blend well together. Thank you so much! Fruit salads with dressings like this are always my favorite – and I love how easy it is to adapt it your tastes for sweetness.